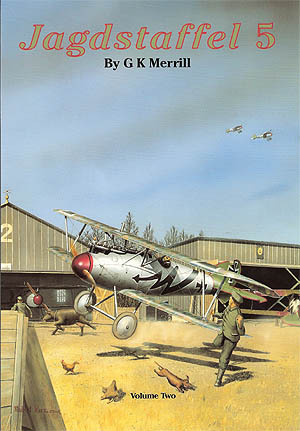 THE full story of Jasta 5, one of Germany's crack air units in WWI, is related in graphic and meticulous detail by Glen Merrill. Supported by many large-format photos, many b/w sketches and all-new colour art by Robert Karr, Bob Pearson and Ray Rimell, many 'well-known' Jasta 5 fighters appear here in revisionist artwork for the first time - Flashar's dragon-marked D.V; Rumey's striped Albatrosse and the enigmatic D.III of Werner Voss, plus many more. For modellers of Albatros D.IIIs and D.Vs, Fokker Triplanes and D.VIIs, there's enough colour data here to keep them going for years! Volume Two contains 56 pages (inc. covers) that concludes the story of Jasta 5 and its pilots with more than 40 large-format photos, and 11 more colour pages depicting over 30 colourful aircraft: Albatrosse D.III and D.V; Pfalz D.III, Bristol F.2b (! ); LVG C.V; Fokker Dr.Is and Fokker D.VIIs. Many wing and plan views are also included plus over 30 additional mono sketches of Albatros D.III and D.V fuselage markings. Fabulous cover art by Robert Karr and Bob Pearson portray the 'Blitz' aircraft of Hans von Hippel.